This brand new house by Stockholm based architects Widjedal Racki is located on the beachfront, in the Swedish capital’s outskirts, and was born out of an unusual arrangement. Commissioned as a collaboration between its clients - a young family with two children - and the Scandinavian wood manufacturers Moelven, the scheme was conceived as a private home, but also acts as a showcase and showroom for the sponsors involved in its construction. Villa Moelben is made entirely from Nordic wood products and aims to be a modern and comfortable family home that is also eco-friendly and energy efficient. To this end, traditional techniques are combined with modern know-how, such as wood fiber insulation, solar heating and ventilation with heat recycling. The architects worked closely with the client to establish a series of keywords - such as ’labyrinth’, narrow’, ’surprise’, ’tropical’, ’modern’ - that would help them incorporate different key concepts into a single architectural entity. 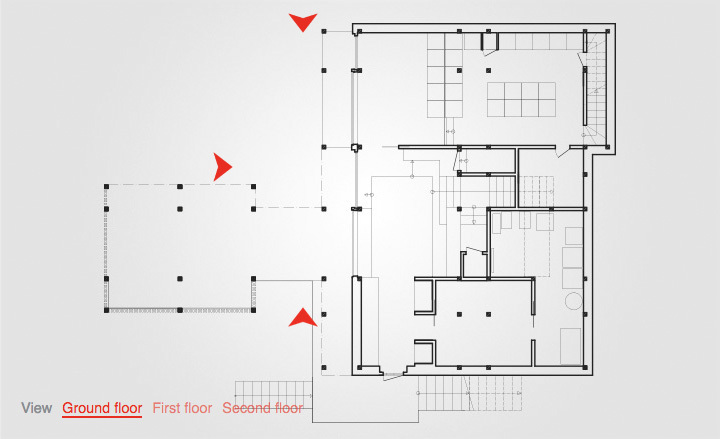 The result was Villa Moelven’s complex composition of spaces, which include playfully hidden parts - for example, walls concealing secret passages - and rooms with no distinct borders. This led to the timber house’s unusual geometry and internal arrangement. Instead of focusing on ’main areas’ and categorising other spaces as ’secondary’, Villa Moelven is designed as a continuous flow of equal spaces, drawing on the concept of a labyrinth. So, while the house’s exterior looks simple and clearly defined, the interior tells a different story. The architects fully embraced complexity and created a journey through the house, laying out its three bedrooms, living room, kitchen and bathrooms across three levels. Incorporating an element of humour and little surprises that are sure to leave its guests with a smile, Villa Moelven is an inspiring Scandinavian villa, combining a clean, contemporary design, spatial research and depth and an environmentally friendly approach. Villa Moelven shows how a modern house can be both beautifully designed and eco-friendly. Its wood was sustainably sourced.